Maybe you’ve already read the history of the mercurial Henry VIII and his wives? Maybe you’ve watched the Showtime series – the Tudors – and have met the villain Cromwell? Maybe you read Hilary Mantel’s Man Booker Prize winner, Wolf Hall, and discovered a different Cromwell? 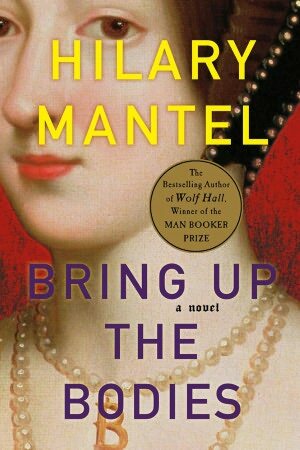 Maybe not, but the power of Mantel’s continuation of Thomas Cromwell’s influential life will still overwhelm you in her sequel – Bring Up the Bodies. But Mantel’s gift is not in the rehash of history or even her humanizing of a man often seen as a manipulator yet a great statesman who changed the course of history. It’s in the details of daily life, secret dreams, unsure emotions, and the pieces of a mind that the outer world never sees. If you missed the background in Wolf Hall, Mantel graciously revisits Cromwell’s common beginnings (the son of a brewer and blacksmith) – important to understanding the disdain of nobility who were jealous of Cromwell’s influence with the king – and his training under Cardinal Wolsey, his disgraced mentor. The dead or soon-to-be-dead bodies are everywhere as Cromwell juggles the king’s changing moods, the country’s lack of funds, Queen Anne’s decline into a nervous shrew, and his own ambitions. The focus in this sequel concentrates on Cromwell during the months that Anne Boleyn was Queen, until she fell out of favor and made way for Jane Seymour. Mantel’s Cromwell is at once despicable and admirable. Revealing Cromwell’s inner soul, as only she can imagine it, Mantel offers a little compassion for a man who is ruled by logic in a world consumed by emotion. Above all, Cromwell is alert to his precarious position – please the king or fall to the scorn of the nobles. Cromwell keeps a Black Book on how to proceed. What a man would do to maintain power has not changed over the centuries – although the chopped off heads have become more figurative than literal. As I read, I fought an overwhelming inclination to identify Cromwell with an ambitious contemporary man I knew – a number cruncher who rose to power by his talent for logical decisions – unafraid to abandon allies when they were no longer useful, even destroying them when necessary, and like Cromwell, taking revenge at any slights. “His whole career…an education in hypocrisy.” Maybe that is part of Mantel’s magic – discovering ways to identify with a public persona and revealing the man beneath the surface. You still may not like him, but you might be able to better understand his motivation. Although you know the ending, Mantel still maintains the suspense; as Anne Boleyn walked to her execution, I almost expected a last minute reprieve – as Anne herself hopes. The humorous asides and personal agonies flesh out the historical characters, especially Cromwell. And who knows, maybe that’s really how it all happened behind closed doors. Cromwell is coming back in the third book of Mantel’s series – I can’t wait. This entry was posted in authors, book review, books, history, reading and tagged Anne Boleyn, Bring Up the Bodies, British history, Cromwell, Henry VIII of England, Hilary Mantel, historical fiction, Jane Seymour, Man Booker Prize, Mantel, Thomas Cromwell, Tudor England, Wolf Hall. Bookmark the permalink. Great review, Rosemary! Made me want to go back and read it again! Thanks. Can’t wait for the next installment. My husband loved The Tudors! This series looks very interesting, I’ll have to show it to him. Cromwell is the star of this series – he won’t be disappointed.